After five years, I allowed myself to walk to the other side of the woods near my home. The rain left behind low clouds, draping the light in swirling grey. The quiet cold soaked through me as I walked past houses and onto the abandoned road around the pond. The neighbors keep deer tents up at all times on the edge of the clearing. This is a common forest and lawless. A hinterland between public and private, wild and domestic. The woods are bordered on the east by a railroad track. The smilax and muscadine grow along these torn edges, mending with thorn and vine. Sealing in the forest. At the gashed line of the track, I hear the Carolina bay swamp spill over into a pasture. The stream is narrow enough here to flow through a culvert, but it quickly widens and bends to gather a forest. This is the beginning of Batterbee Branch creek, which feeds to Cat Creek, then the Withlacoochee, then the Suwannee. I am at a headwater, a place where a river is born. The shards of property delineation and commerce have settled in, but they haven’t destroyed the land. We are still here. How do I articulate my love for this place? Cleared by hungry hunters, cut through, and occupied? For years I have stayed away from the fragmented woods. All of this time I told myself to leave the wild ones alone, they don’t want me there. I walked back from the train track, going off the path I made. The river birch became thick, bark peeling in large strips. There I found a coyote den. A home dug in the sand, made in the echo of the creek, as I made my home with my family, in the echo of the forest. Solace found me. 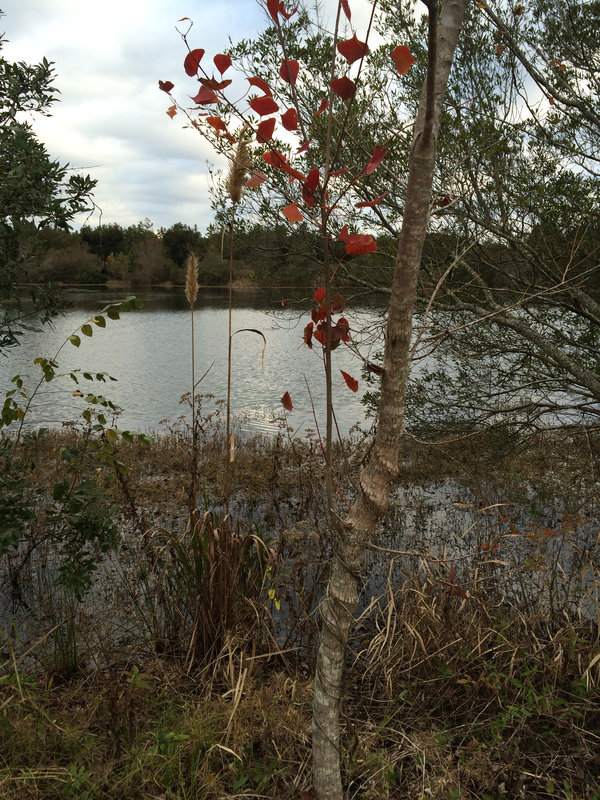 I left the woods and laid beneath a young slash pine near the pond. I had forgotten the chill of the day until I felt the warmth of the sand and pine needles beneath me. Here, my ear to the ground, I was uncertain if the warmth I felt was from my body or the ground beneath me. The sun cradled me with the arms of the earth. Here I left worries of the humming news. A bright green aphid, emerging with the wild peas, crawled up the black threads of my dress, a tired ant bit my hand. A squirrel offered concerned chattered. A wood duck dove into the hydrilla and lily. A kingfisher perched on a power line. I didn’t feel cold again till I stepped again onto the pavement. While laying on the ground I thought about an article at the Atlantic about professional snugglers and friends for hire. One professional snuggler believed the service was appealing because the professional friend offered no judgment. Our digital lives are about staging the perfect moment, and this tendency has crept into our entire lives. The result is a stifling anxiety around intimacy. This seems accurate. But the article concludes with the writer realizing rent-a-friends are ultimately cold, cheap and detached. Yes, Leonard Cohen, I’ll spend the rest of my life with your songs.